A large number of social trends are closely tied in with the stock market and the economy. From short skirts being a sign of booming economies, to widespread disdain towards politicians in tough times, the world around us is closely linked to movements in the stock market. Is it any surprise the economic boom of the sixties was swinging with leggy women? The late booming 1990s were just as full of long legs. It is really no surprise George Bush was pretty much universally and people could not wait to see the back of hum as stocks crashed through 2008. No arm of society really escapes this phenomenon of stocks correlating social trends, and the online business world is no different. Interest in making money online is one trend that appears to be swinging with the stock market turns. 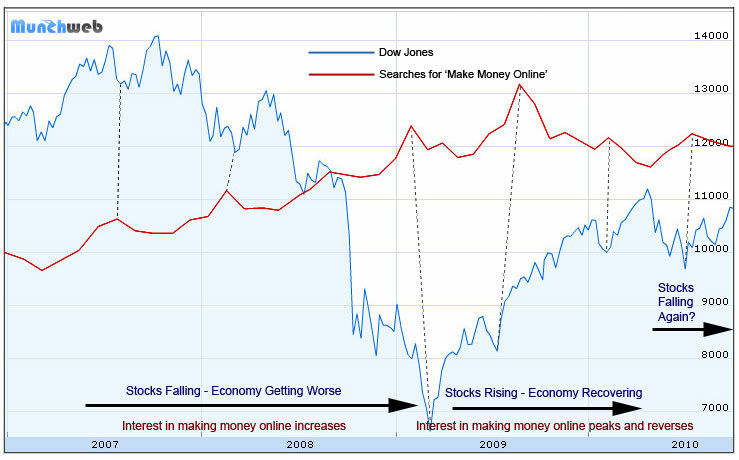 The graph below shows how there has been more searches for the phrase ‘make money online’ in Google as the Dow Jones stock market has been dropping, and vice-versa. Really this makes complete sense. When the stock market drops, the economy soon suffers, credit tightens, people have less money and jobs are lost. More people will look to alternative ways to make money like finding ways to earn money online. The internet is still a growing industry, so any downward movement in searches for making money online will likely be less than any upward movement, as there will be an underlying bias towards growth. We also could not expect the trend to match up perfectly in sync as short term events and news could create up or downward swings, although the overall link is still intact and visible over the longer term. The graph above does match up to those two assumptions. Where Next? Is Making Money Online Set to Boom? Which direction stocks turn next should dictate whether interest in making money online will grow or decline. At the time of writing (early October 2010) several reliable future indicators of the stock market are strongly aligned to suggest a fall in stocks should happen soon, and such a fall should be at least a relatively large size (at the absolute least a 2000 point drop in the Dow). It is not impossible for such indicators to remain at an extreme for a long time, but it does indicate that a downward trend in stocks is very likely on the horizon at some point, which will also see the economy resume a downward trend. Interest in making money online to reach new peaks as people are faced with more difficult financial situations turn to alternative sources of revenue. Interest will not peak until stock markets have bottomed. The peak will possibly come after the stock market bottom due to the delayed echo of damage that follows a fall in stocks. While the economy remains depressed interest in making money online will likely remain high. With people desperately looking for quick and easy money spam will increase. This trend has already started. The scam teachers of internet marketing will see a boom in clientele as more people desperate to make money buy their courses and products. Greed will drive more questionable marketing tactics and misleading sales pitches from unethical internet marketers. Hatred for scammers and unethical internet marketers will increase both as a result, and also due to the need to find an enemy and assign blame that accompanies a downturn. A general distrust against internet marketers as a whole will grow considerably and the industry will be largely tarnished leaving the ethical members of the internet industry tarred with the same brush. A boom in spam and scammers and a growth of hatred towards internet marketers will drive more rules and legislation on the internet business community. A growth in communities (such as The Salty Droid) that name and shame online scammers and serve to protect people online will grow in terms of followers and aggression. Record fines and punishments against online scammers and spammers will be delivered. While scammers and spammers have had somewhat of an easy ride during the boom times, they will eventually become a hated target if stocks drop far enough. Competition will increase in the field of simple one-man online businesses while the struggling economy hampers the amount of money and ad revenue being spent online. Generally it will be a more difficult time for people new to the online industry to get started. There will be a large growth in the available work-force for online work such as content writing and data entry. This will put downward pressure on wages for such positions. Companies such as Demand Media (aka eHow.com) and Mahalo that produce large farms of content online using cheap freelancers will continue to flourish and ultimately take market share from traditional media outlets. Fewer people will produce online content simply for fun and fame. Community driven sites like Wikipedia and YouTube will see the rate of contributions decrease, and the rate of spam or made-for-marketing content increase. While this is just fun (and hopefully insightful) speculation on the future, such trends completely depend on the stock market falling, and the severity of such trends greatly depends on how far stocks actually fall. Where do you think the internet industry is heading? Interesting! I can’t tell the strength of the correlation or likelihood of causation, but it’s good to see the growing increase in ‘making money online’ in the states (assuming this is American data). This shift towards entrepreneurialism could mean people are taking more responsibility for their welfare, and the resulting creativity and effort can only be good for the economy. However I’m more interested in knowing when short skirts are coming back in. Hey Alex,I doubt we’d see short skirt boom for at least 20-30 years. Enjoy the legs on show at the moment, cause they probably won’t be on show for much longer.